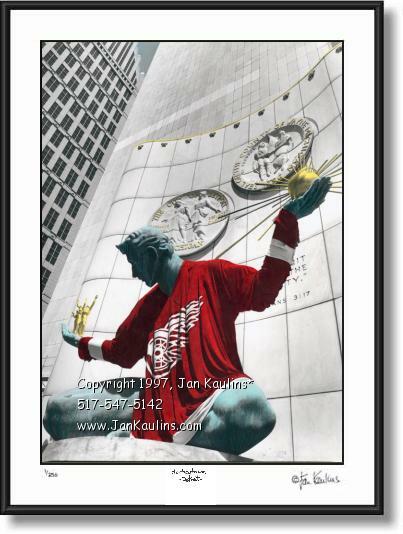 SPIRIT OF DETROIT RED WINGS picture photo art print for sale. DETROIT RED WINGS SPIRIT OF DETROIT JERSEY photo art picture prints photography for sale. SPIRIT OF DETROIT Red Wings Jersey photograph picture art print photo poster for sale. Spirit of Detroit Detroit Red Wings jersey photo picture photography art print for sale. This Red Wings Spirit of Detroit color Detroit picture photograph for sale is made from an original hand-colored black and white photograph of The Spirit of Detroit statue in downtown Detroit, Michigan. In this striking Detroit Red Wings photo we see The Spirit of Detroit statue, designed by Marshall Fredericks, draped by a giant size Detroit Red Wings jersey. This rare photo is of the very first Detroit Red Wings jersey put on The Spirit of Detroit. You can see the different more recent Detroit Red Wings Jersey on The Spirit of Detroit on this website. This Detroit picture photo captures the Detroit Red Wings jersey placed on the Spirit of Detroit Marshall Fredericks statue as a tribute to the Hockeytown Detroit 1997, 1998, and 2002 Stanley Cup Champions Detroit Red Wings and to The Stanley Cup Championships to come. Go Detroit Red Wings! Also see THE SPIRIT OF DETROIT STATUE DRAPED WITH THE 2004 NBA CHAMPION DETROIT PISTONS JERSEY on this website in Detroit Landmarks Gallery #2.